All Inclusive 5 Star Resort with Action Packed Events"
Featuring an in-house night club and a beauty parlour, Hard Rock Hotel & Casino Punta Cana is located in Punta Cana and offers 5-star accommodation. It also provides an all-inclusive meal plan, a kids club and a ballroom. The resort offers an 18-hole golf course, a kids pool and valet parking. In sunny weather, the local area can be explored by hiring a bicycle. Recreational facilities include miniature golf. 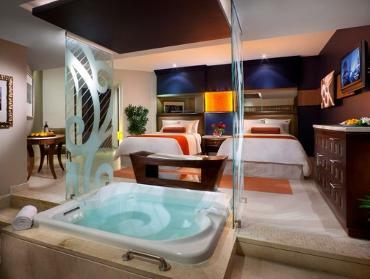 Hard Rock Hotel & Casino Punta Cana offers 1787 air conditioned rooms filled with all the essentials to ensure an enjoyable stay. Bathrooms are stocked with necessities like a shower and bathrobes. We are going to the Dominican Republic! All Inclusive 5 Star Resort with Action Packed Events"Join us over Labor Day Weekend. There Will Be Over A Dozen Of The Countries Best Musical Artist Coming Soon. All events for 1 price! Events include comedy set, concerts, pool parties, beach BBQ, Casino tournaments and more.